We've almost got the winter beat here on Pine Island. We just had two days where it actually got warm enough to go outside wearing shorts and the water temperatures crawled back up into the lower 70's. That meant the redfish were everywhere and the only thing that kept us from totally clobbering them was the dense fog in the mornings and high clouds in the afternoons. I spent yesterday on the water with angler Bob Koch who splits his time between Atlanta and Matlacha. Bob is also a certified fly casting instructor so it was great to have someone on the bow who could handle any situation. Unfortunately the reds didn't want to eat flies yesterday. Bob cast at dozens of different fish using several proven patterns but no takers. We also threw as several very large snook and even though we got no hits from them either it was just great to see that some big breeders survived the cold snap. I went out for a few hours on my own this afternoon with a spinning rod and live shrimp just to be sure that the fish were eating and, bingo. This 14 inch rat red was the first fish I cast to and he ate immediately. I also landed a dozen ladyfish and a few nice trout once I switched back to casting flies. Of course today ended with the arrival of another cold front and our temps will drop back into the upper 40's tonight but these systems are getting less severe. This won't be the last one of the winter but spring is less than a month away and the fish are back for good already. Fly Fishing Captain Greg Dini and Derek Redwine from Sam Root on Vimeo. Photographer Sam Root from Salty Shores also has some great videos on his website and this one is my favorite. It's shot in HD so give it time to load before playing it. This video is less than five minutes long but it's better than any TV show I've seen in a long time. Last year's April issue of Kayak Angler Magazine had a short but very good article about fishing the waters of Pine Island, Florida. It got me thinking about how excellent this area is for any angler looking for an easy trip for light tackle fishing in salt water. You can read the article here. Pine Island and Matlacha have been a second home to me for over nine years now and I'm thrilled to be spending the entire 2010 tarpon season up here. After ten years of fighting the crowds in Key West and four years of only hooking twenty pounders on Vieques, the monsters of Pine Island Sound will be a welcome challenge this year and a chance to return my big tackle back into the fight. 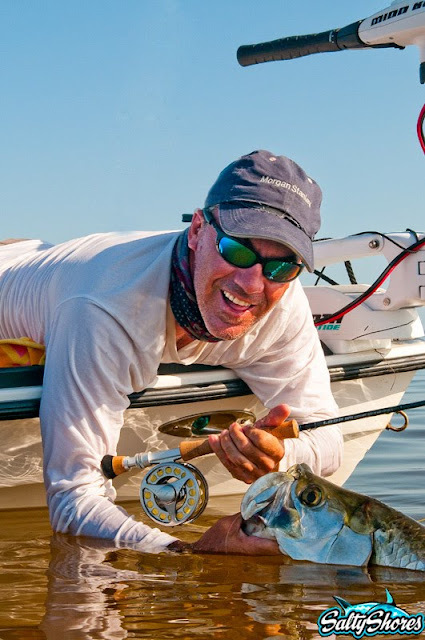 This is the only place in all of Florida that rivals the Keys for the sheer amount of shallow water fly fishing opportunities, not just for tarpon but snook, redfish, and trout, too. On top of all that, getting to Pine Island is far less expensive and it's accommodations are a fraction of the cost of Key West's. My schedule is wide open for tarpon fishing in the spring and summer or great redfish this fall, so feel free to give me a call at (787)435-4833 and we'll talk about booking a trip in this excellent and affordable part of Florida. Or check out my redesigned website at: www.wildflycharters.com.